The recent EICMA event in Milan revealed some of the hottest new bikes for 2013 from Honda, Ducati, Triumph, and KTM. 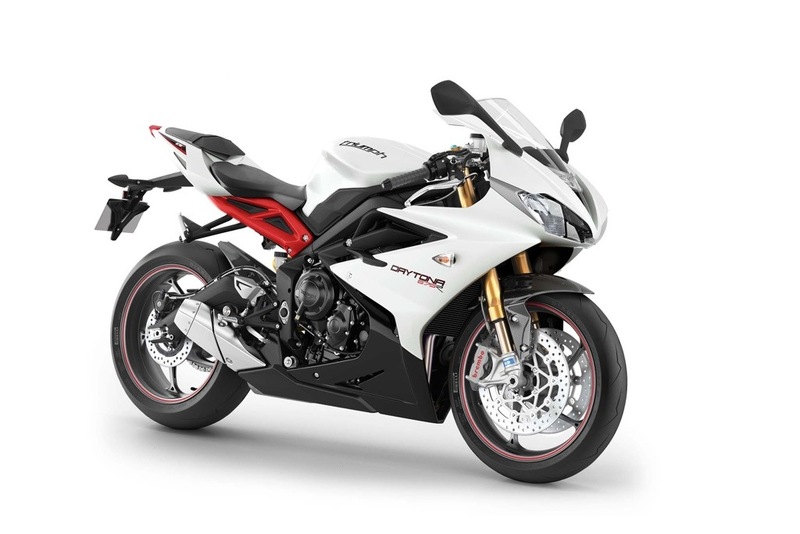 Kicking things off is the completely revised Triumph 675 and 675R. Far from being a style revamp, Triumph have completely reworked the machine from the ground up. The most obvious visual change is the new side-mounted exhaust taking over from the underseat can of the current model, saving the majority of the 3kg weight difference in the 2013 model. While the whole bodywork has been revamped, it is when you peel back the plastic that the full extent is revealed. With a brand new chassis, with fewer sections meaning less welds, a slipper clutch as standard along with new KYB suspension and optional ABS. The race going 675R will feature Öhlins suspension, the latest Brembo brakes and changeable ABS as standard. Completing the style differences, the R version will also have a carbon hugger and cockpit while the sub frame and pin striping on the wheels will be red. One of the biggest announcements of the event came from Ducati. With updated Hyperstrada and Hypermotard machines, both of which will feature an 821cc V-twin and the latest in DTC (Ducati Traction Control) along with an all new steel trellis chassis as well as being equipped with Brembo M4 brakes. In a case of beauty and the beast, the final two Ducati’s that were announced were the Diavel Strada – a touring based version of the Diavel machine that features a taller screen, raised handlebars, larger and heated grips as well as a pillion backrest and 41 litres of pannier capacity. On the other end of the spectrum, the gorgeous 1199 Panigale R was released featuring titanium conrods, lighter crankshaft, flywheel and a revised engine allowing 500rpm higher over the standard. In a clear move to make the World Superbike version competitive in its first year in 2013, the R version will also feature a taller windscreen, a full Termignoni exhaust system and a dedicated track based ECU. The other major announcement came from Honda who announced three brand new 500cc machines aimed at younger and ‘new to biking’ riders. Featuring a 46.9bhp engine that fits within the new motorcycle licence laws, all three bikes will be very similar internally; however the three styles cover every base. The CBR500R machine draws from the race derived CBR600RR; featuring a full fairing while the CBR600F takes a style note from the CB1000R. The final model, the CB500X is the adventure bike style. Beside the launch of the three new 500cc models, Honda also revealed an updated CBR600RR with a lighter frame; updated Showa forks updated fairings to match closely that of the MotoGP RC213V and increased engine upgrades. KTM also launched a brand new model in the form of the 390 Duke. In close style to the 125 and 690 machines, the new 390 is aimed at younger and urban riders. With full Bosch ABS as standard and WP suspension the machine will also fit within the new licence laws producing 44bhp and weighs just 139kg without fuel.